Like the words "obsessed" and "viral," the term "household name" is one that is bandied around way too often these days. What can I say? Gen Z loves speaking in hyperbole. However, it's hard to think of another store that can be considered more of a household name than good 'ol Marks and Spencers, an establishment which has presided over the Great British high street for over a century (yup, that's a whole lotta tights). While it may still have the most comprehensive menu of knickers you'll find anywhere, it has historically not had a reputation for being the coolest fashion brand on the block. But it has since proven its fashion credentials thanks to various shake-ups in the design teams and the creation of trend-led lines such as Autograph. I've not ventured up the escalators in a Marks and Sparks for a while—apart from when I need the aforementioned underwear—but there's something about it that feels like returning to your parents' house after a tiring term at uni. The Oxford Circus store is a spacious utopia of neatly stacked tees and comforting rails of cashmere. But don't be fooled by its homeliness, because once you get to the good stuff, you'll be wondering why you haven't been shopping there more. 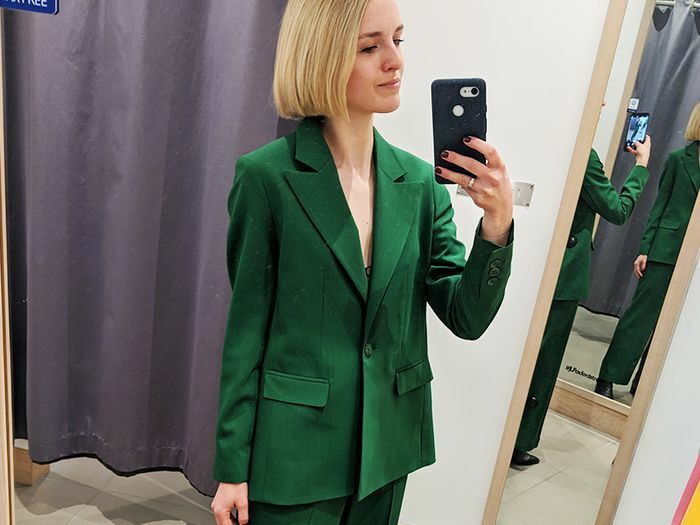 It might be the old faithful of the high street, but trust me when I tell you that there's nothing boring about M&S's spring/summer 2019 collection. 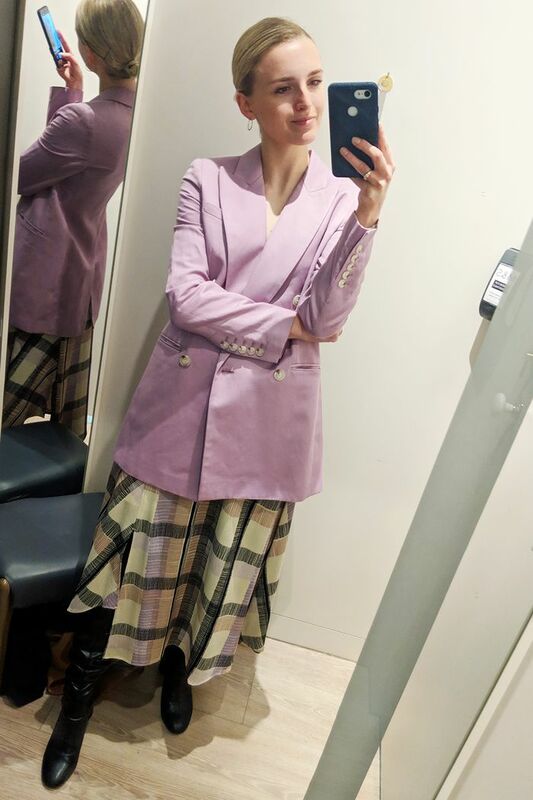 From pastel-coloured blazers and printed midis to luxe trousers and knitted co-ords, there's plenty of goodness to be found in-store right now. I've done all the hard work for you and found the 18 pieces that you need to see this season. Happy shopping. Style Notes: Blazers for spring? Not so groundbreaking. But make one in a head-turning shade of lilac and throw it over a midi skirt? Now you're in fashion-editor territory. Style Notes: I've been a little ambivalent about the denim jacket renaissance, but unexpectedly, Marks and Spencer might've just converted me with this oversized, boxy iteration. Style with straight-leg jeans and a white tee for '90s supermodel vibes. Style Notes: First things first: This outfit feels so damn expensive. I'm a big fan of the knitted top (this season's slightly curveball trend), which is perfect for tricky spring temperatures. Also, the weighty fabric looks super luxe when paired with draped drawstring trousers. Style Notes: Marks and Spencer has a great selection of maxi and midis this season. I'm a big fan because they don't feel like the sort of bohemian dresses that only really look good in 30 degrees on a beach in the Maldives. This drop waist number will look just as great in London as it will on your summer hols. Style Notes: I know there was a bit of a slip skirt frenzy last year, but I do think they're a great and timeless addition to any wardrobe. This rust-coloured style is lined so you don't have to worry about VPL, and it offers just the right amount of polish to a textured tee. It's also available in black FYI. Style Notes: This pleated skirt does exactly what it says on the tin: it's flattering, flowy, the perfect mid-calf length and in a versatile monochromatic print. All in all, a solid staple that will go with everything you own and be adaptable for all seasons. A wardrobe win if we ever saw one. Style Notes: I feel very Out of Africa in this beige getup. Shorts can be a tricky thing to wear, but this M&S pair gets the proportions right with the longer length and waistband that sits just above the hips. This top isn't available online yet, but you can shop a similar style below. Style Notes: Our style insiders have told us that knitted co-ords and dresses are selling like crazy this season. I like how the skirt on this grey two-piece is slim around the hips but then flares out at the knee—a far more flattering fit than others I've seen on the high street. I would, however, order a size up in the skirt if you prefer a looser fit.